The Guardians of the Galaxy Space Station Challenge used Rocket and Groot as inspiration for student space science experiments on the International Space Station. The two winners of the contest were announced on May 22, 2018. We now know who's on Team Groot and who's on Team Rocket. Two student teams — one from Colorado and the other from Tennessee — have won the Guardians of the Galaxy Space Station Challenge, a competition run by the Center for the Advancement of Science in Space (CASIS) and Marvel Entertainment, the organizations announced Tuesday (May 22). The challenge asked students ages 13 to 18 to submit ideas for experiments to be performed aboard the International Space Station (ISS). The Groot representative is a team from Golden, Colorado, whose experiment will test the behavior of plant-watering misters in microgravity. Team Rocket hails from Greeneville, Tennessee; these students aim to assess the effectiveness of an ultraviolet-light-activated dental glue in microgravity. "This challenge created an incredible response from young researchers around our country, which is a testament to the reach and excitement of collaborating with an entity like Marvel Entertainment," said Ken Shields, director of operations and education initiatives at CASIS, the nonprofit that manages the ISS U.S. National Laboratory. "The two selected investigations provide diverse, fun, and important research concepts, and we thank our partners at Marvel for bringing further awareness to research opportunities available through the International Space Station," Shields said in a statement. The two student teams will now work with contest partners DreamUp and Space Tango to get their experiments ready for launch, which should happen later this year, contest organizers said. 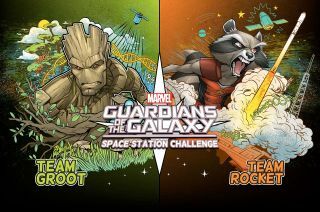 The Guardians of the Galaxy Space Station Challenge was open to submissions from Jan. 10 to Jan. 31 of this year.